What do therapists do for therapy? If you’re Shenna Shepard of Pepperell, MA, you make macabre art pieces from doll heads, tin containers and assorted bric a brac. “For me, it’s therapy, and maybe for people who come to my booth. They giggle and laugh. 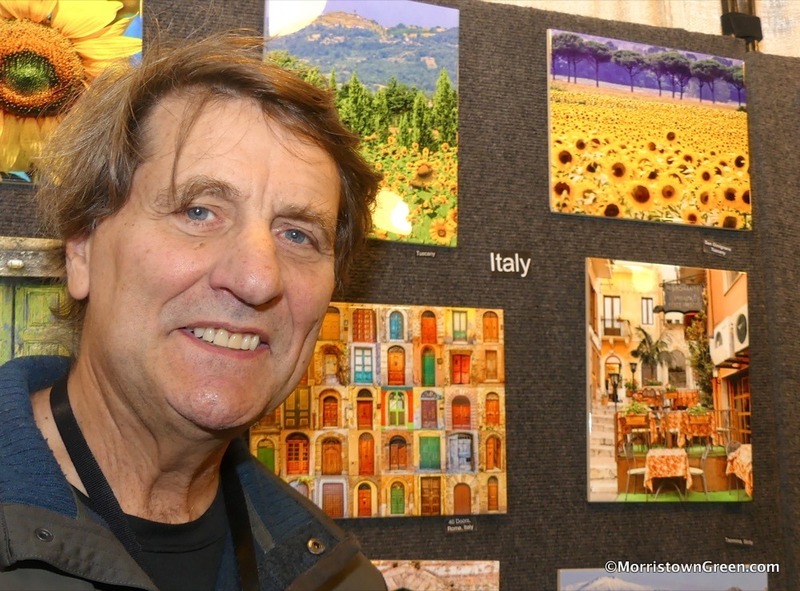 It brings a little lightness to life,” said Shepard, whose works are among the quirkiest for sale this weekend at the 42nd annual Morristown CraftMarket. “Visually stimulating, that’s the effect we go for,” show Director Geoff Price said at Friday’s opening. The taste buds aren’t overlooked, either. Price pointed us to Dena Baker of To the Queen’s Taste, a Newton, MA, specialty bakery that is one of 68 first-time exhibitors at the 2018 CraftMarket. Baker, who studied music at Fairleigh Dickinson University, got her culinary start 30 years ago making Eccles cakes, currant-filled pastries banned by the Puritans in 1653. Her offerings now include the Big Ben (buttery brioche bread with chocolate covered ganache), North Country Apple Tarts and Wimbledon Strawberry Shortcake. Another curious find was Pip’s Park. Tom Pippet of Churchville, PA, has created miniature models of virtually every stadium and arena in America except… Notre Dame Stadium. “Notre Dame would be my No. 1 seller everywhere I go. But they have not granted us licensing rights,” lamented Pippet. Ah, where is the Gipper when you need him? A few booths down, Christopher Buonomo of 13 Degree Studios in Philadelphia showed sculpted sycamores, maples and cherrywoods. He loves frightful forecasts–they mean more dead trees for his art. “Nor’easters are the best,” he said. Shoppers Maxine and Emily Wolper, a mother-daughter tandem from Morristown, appeared content with storm-proof, portable purchases. Maxine found fingerless gloves from Functional Funware 4Ever of West New York. Emily bought a red clutch bag from Stephanie Bee of Matawan. “We are crafts fair junkies,” confessed Maxine. Emily likes the CraftMarket because “it’s a little more down-to-earth” than other shows. Plus, it supports community charities. “And they have wine,” she said. Their friend Beth Shirley chimed in that she is awed by the vendors’ creativity. Which brings us back to Shenna Shepard. Does the Rutgers-trained psychologist decorate her office with her artistic creations? The 2018 Morristown CraftMarket continues from 10 am to 6 pm on Saturday, Oct. 20, and from 10 am to 5 pm on Sunday, Oct. 21. Admission: $10, or $12 for the whole weekend. A silent auction benefits the Neonatal Intensive Care Unit of Morristown Medical Center. The Armory is at 430 Western Ave. in Morris Township. Parking is free.